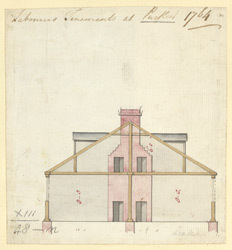 Plan of the Smith’s shop and guard room at Purfleet in Essex. A magazine that originally stood just outside Greenwich was demolished because it had become unsafe and an Act of Parliament was passed and land was purchased at Purfleet for a new magazine. Five new magazines were erected along with a Blacksmith’s shop, a guardroom, barracks and some labourers tenements.